Live music and entertainment, singing, tree lighting, unique artisan vendors, festive meal, decadent desserts, silent auction, rafﬂe and dance party. 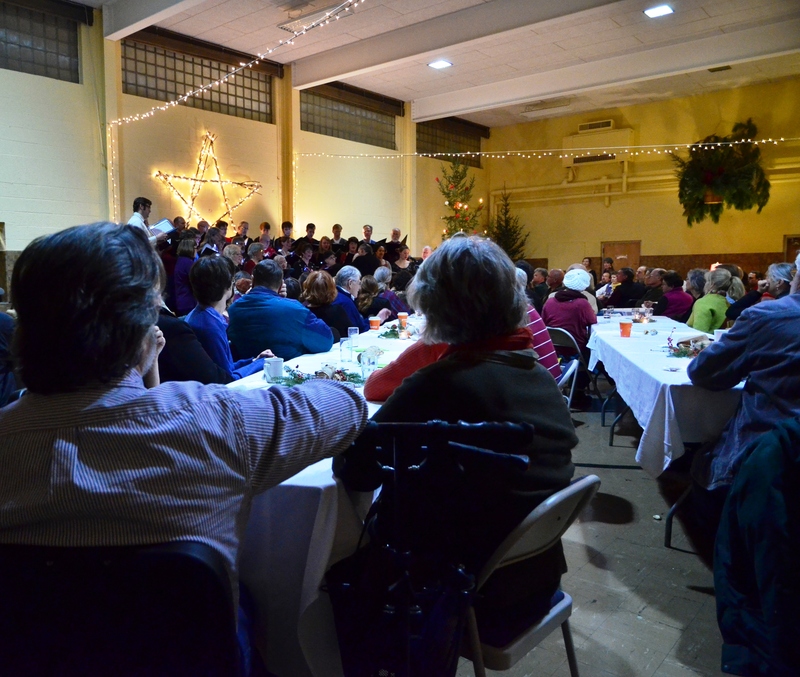 Tickets available at Viroqua Food Coop, Pleasant Ridge Waldorf School ofﬁce, and Growing for Good greenhouse. Babysitting available at Youth Initiative High School by students from 6:15 to Midnight. 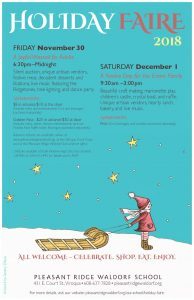 Call YIHS at 608.637.6445 for details and to RSVP (appreciated but not required) or fill out the form here: YIHS Holiday Faire Babysitting Pre-Registration. 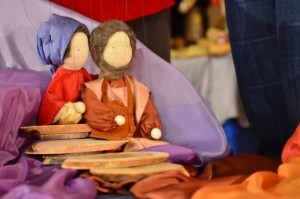 Beautiful craft making, marionette play, children’s castle, crystal boat, and rafﬂe. Unique artisan vendors, silent auction, hearty lunch, bakery, and live music. All are welcome as we open up the school for a day of holiday magic. Shopping, food, puppet shows, crafts, and holiday cheer. We feature vendors each year that showcase artisan, handmade gifts for our community. Kindred and Nicholas Wazee-Gale : Wood. Bark. Deerskin. Beads. 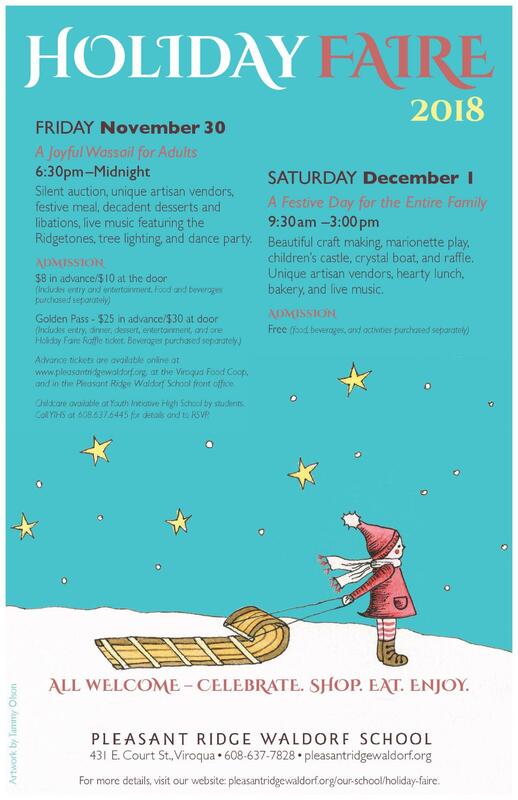 Do you have items or services that you’d like to donate to the Holiday Faire Silent Auction? We’re asking for gifts valued at $25 minimum. Please click on the form below to submit your donation. Please fill out this information completely. Contact Kate Holmes at 608-387-2236 with questions. 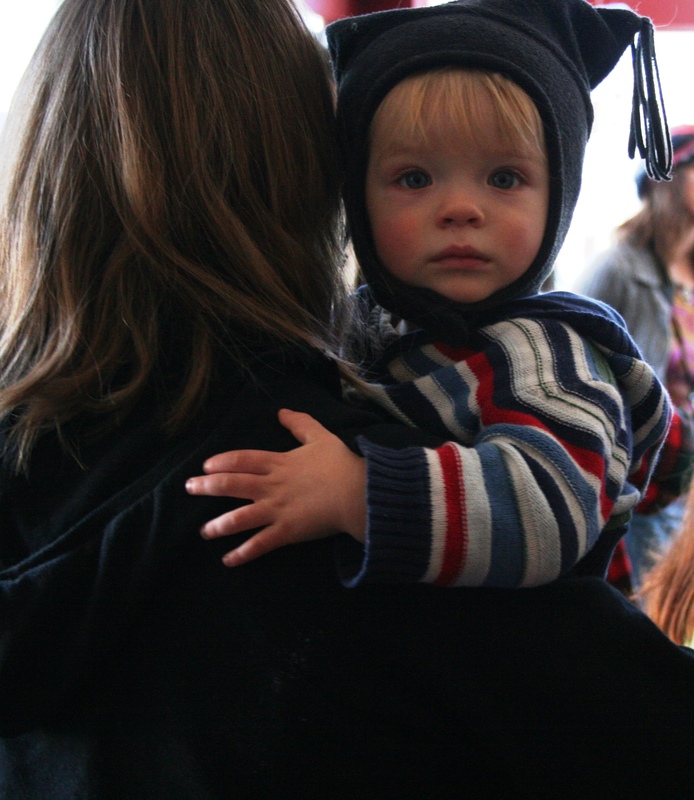 All donations will benefit our children and programs at Pleasant Ridge Waldorf School. Thank you for your generous gift! 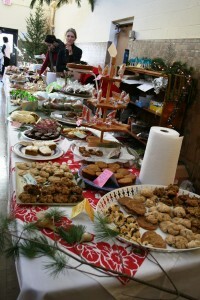 Thank you for your support of the PRWS Holiday Faire!